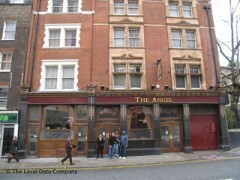 About: The Angel is a Samuel Smith pub with a great atmosphere and serves beer at extremely reasonable prices alongside a selection of pub and vegetarian dishes. It has become a meeting place for musicians and actors. They also have a dartboard. Cosy pub with a maze of rooms upstairs. Beer is cheap and location is great for meeting up in central London.